Yesterday, the fiancée I had the opportunity to sample some dishes from Pachuco a new modern Mexican cuisine restaurant celebrating its opening weekend. Located just steps from Broadview station on Danforth, the restaurant is the latest addition to the neighbourhood, just west of Greektown. After walking down a flight of stairs into the main room we were greeted by a dark lit space that had an ambient, relaxed feel. There was enough seating for a good amount of people, but the space was small and the bar took up one wall. O nce we were seated our server brought us the menus and told us about the drink specials. 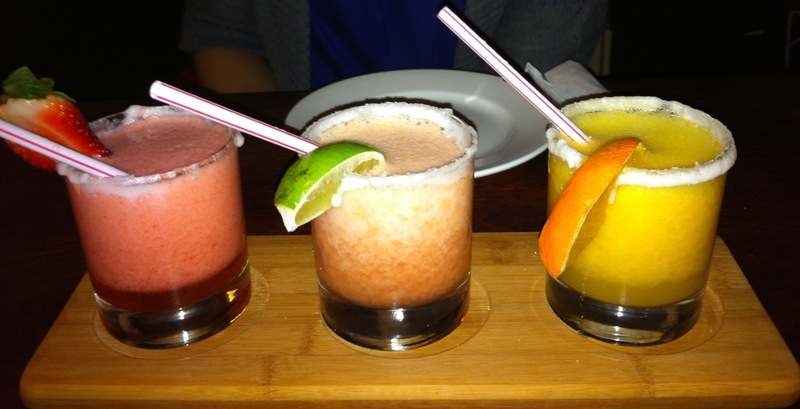 We were drawn to the margarita sampler (to the left) ($15) and chose strawberry, guava and mango. The other flavour options were: blueberry, spicy mango, traditional and pineapple. At first I thought I’d enjoy the mango one the most, but the guava one grew on me, and the strawberry one was consistently good each time I took a sip. We just found them to be a tad too salty, which took away from the flavour – especially in the mango one. On to the food, we had the opportunity to pick from two dishes from the menu. The first one up (top dish on the left) was the Chicken Empanadas ($9). They were stuffed with chicken and olives and served with a very tasty artisanal mole sauce. The pastry was fluffy and let you enjoy the flavourful stuffing inside. They were the highlight of the meal and I could have eaten way more. The main course was the Taquitos de Cochinita pibil ($15) (not shown: tortillas, rice and black beans – the last two were $4 extra). In the bowl was a delicious slow cooked pork marinated with achiote spice and the additional toppings on the right were peanut and arbol pepper salsa and Habanero mayo. 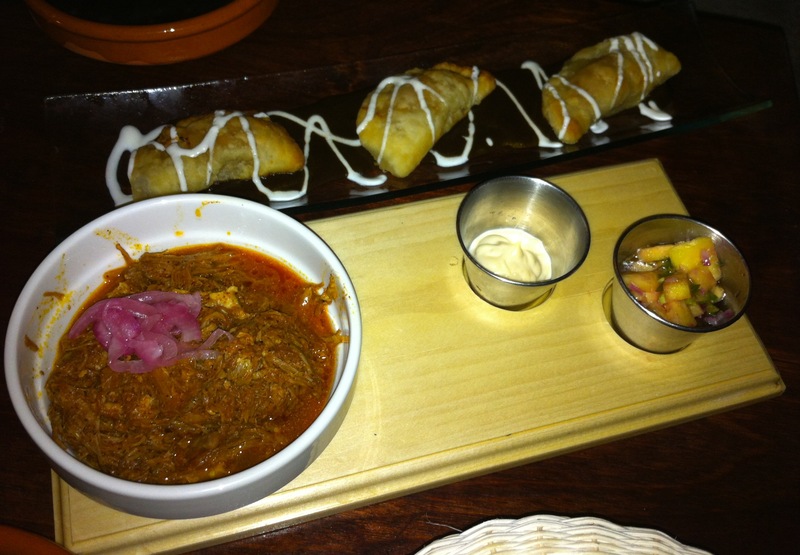 The pork was amazing, and the salsa/mayo combo added great flavour to the taquito, which we both ate three of; so along with the empanadas we were perfectly full. Though a bit pricier than we’re accustomed to paying for Mexican food, we both enjoyed the ambiance of the location, as well as the service and great food. If you’re looking for a nice dinner out on the Danforth and craving a modern take on Mexican cuisine, I recommend giving Pachuco a try. If you’re on Twitter, don’t forget to follow them @PachucoResto!